Discussion in 'Console & PC Gaming' started by GTPNewsWire, Jun 5, 2018. This article was published by Brendan Rorrison (@Brend) on June 5th, 2018 in the Gaming category. Sander 001, glassjaw, Jay84 and 1 other person like this. 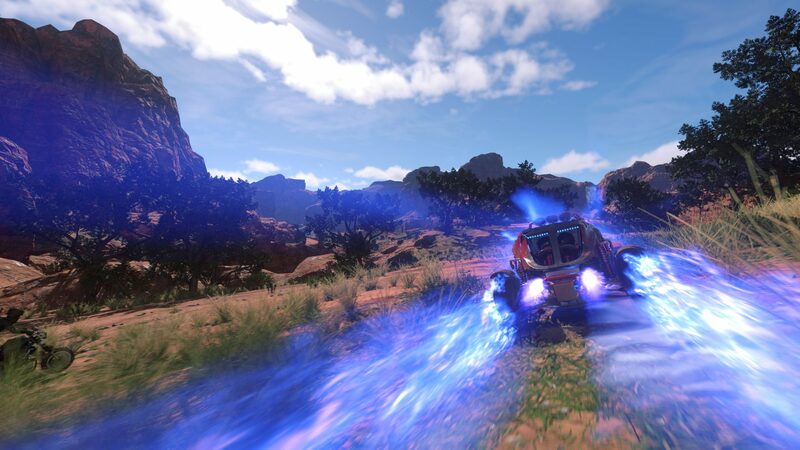 Ultimately, OnRush is a hard sell to anyone on the fence. It is exactly where I find myself. Dan, letsdothis97, FT-1 and 1 other person like this. It's going to be an interesting few months Post-release seeing if a community forms and what support will keep people playing. A higher GTP review score than both GT Sport and Project Cars 2. Totally agreed with @doblocruiser in terms with being on the fence. Sure it looks fun, but I feel as though the concept will age too quickly for a £45 game. To @Brend that was a superb write-up but I still find it hard to pull the trigger and pay full price for this game. And chances are when it does drop in price, The Crew 2 will be out. doblocruiser and Brend like this. Neither of those titles are even related to the game though so unsure what point you're trying to make here. OnRush doesn't even count as a racing game, really! The average score is also 3.8, a measly 0.1 of a difference. Like I said though, shouldn't matter. Nobody is going to go to OnRush for what either sim title offers. @FT-1 - Very understandable, the timing of release puts it right up against The Crew 2 and then the inevitable E3 hype that will take over! Bush_Killa-73, Dan, glassjaw and 4 others like this. If ever a game NEEDED a demo its this..
glassjaw, UnkaD and TheGeologist like this. Very good review that pretty much mirrors how I feel after my time with the open beta and the first few hours with the full game. I really hope this game finds an audience. Oyashiro-sama, ron24, Factor41 and 1 other person like this. I really enjoy playing Project Cars 2 and GT Sport but it's just the same thing repeated over and over with different cars and tracks. Yes, the tracks and cars offer unique experiences but nothing radically different. Onrush however provides something truly new and original. Codemasters have done their own thing here and I love it. The Beta got me onboard instantly, because of the unique gameplay style which isn't "first to the finish line". I crave new experiences and Onrush feeds my desire for it. Definitely buying this game. Bush_Killa-73, MeanElf, Miths and 1 other person like this. Great Review. I think that the strongest positive about Onrush is that taking the multiplayer, class-based, hero-shooter/MOBA like LOL, DOTA and Overwatch and apply that to a driving game is something that is very unique and stands out from other arcade racers. And from what I've played in the open beta I think Evo nailed it with style and polish. I play Overwatch a lot and I revisited Motorstorm Pacific Rift recently so I feel at home with Onrush. I'm still kinda iffy on whether I want to buy this or not, but I really do hope that this Onrush finds it audience cause the fact that it's not a traditional arcade racer is definitely a turnoff for many. I know it's the former Evolution studios team, but they are part of Codemasters now. And if Dirt Rally & Dirt 4 are any indication, they post-release support is as good as non-existent. Sure the obvious bugs will be ironed out but don't expect much in regards of DLC or freebies. That's not what Rushy has said and the team are their own bosses, pretty much, given all the freedom by Codemasters HQ as a part of the deal. That was a pretty indepth review @Brend and probably more positive than I expect many game sites will be. Being one of those players on the fence, I played the beta only twice (not a huge amount by any standard) and just don't see the point. At least a game like Rocket League you're playing soccer with a goal to win the match, and a game like PUBG your match lasts until either you die or you are the last one standing. In Onrush, I was never sure of my objective other than to keep driving and smashing into things. A fan may call that ACTION, a non-fan would call it POINTLESS. I just don't see me playing this more than for the 5-min novelty it inspires. @Brend says in his review "For the first few hours, it may feel like you don’t have a clue what’s going on with the chaos a bit too overwhelming. Don’t worry, this is normal." That may be, but it'll lead to a lot of early players - including me - saying 'I wanna race! I don't get this. I'll go play <insert game> instead'. Upwards of 50% by his estimation a few paragraphs earlier. That's a lot of potential sales Evolution's throwing around and not catching. There's no way I'd stick with this for a few hours to possibly understand - or not. It seems adequately finished, as I experienced no bugs and everything ran smooth which is nice for a beta. For me, it's a pass, though I may redeem if put on PS+, but probably not as I generally avoid online gameplay. I guess after Evolution wanting more realism after Motorstorm and doing Driveclub, I just expected (wanted) Evolution to take over GRiD for Codemasters. Sadly, we got this which is a bad Motorstorm with out the race. I applaud Evolution for thinking outside the racing box, But for me, my chair is securely inside the box. I end the review on a note that totally understands what you're saying. This is a huge gamble for the creators and anyone that pays the money to give it a go Day 1. The outlandish nature means that there's nothing really I (or any other fan) can say to change how you feel. All I know is that once it clicks it feels fantastic and that's when the real strategy etc comes into play. I'd take something like this over a slightly uninspired affair like DiRT 4 (Especially after the simply incredible DiRT Rally) but I can see there's an audience for those pure basic arcade racing experiences. Bush_Killa-73, Rustyhole, ron24 and 2 others like this. This is a huge gamble for the creators and anyone that pays the money to give it a go Day 1. The outlandish nature means that there's nothing really I (or any other fan) can say to change how you feel. All I know is that once it clicks it feels fantastic and that's when the real strategy etc comes into play. It's surprising to me that Evolution and Codemasters would take such a risk with the position they're in. I get the impression they expected to get more out of making a vehicular-themed Overwatch/Fortnite/whatever. Unfortunately, I've read that according to the data, like from Steam, most of the people who play that kind of popular game are only going to play that popular game until everyone starts playing the next one. I'm pretty certain OnRush is not for me. Weaponized racing and takedowns are a turn-off by default, and making it exclusively all about that combat doubles down on that. An overriding focus on multiplayer (and online requirement) is also a turn-off by default. I certainly have nothing against a game that tries something different (I know you know that @Brend), but give me something more about driving and made for solo play. For example, Trailmakers looks fun and I'm hoping it will make the jump to PS4. Nevertheless, I empathize with anyone who loves this game, because I adore several underappreciated titles myself. Actually, it seems the more I love a game, the more likely it will fail. Rustyhole, ron24, Brend and 1 other person like this. I've said quite a few times but I feel like it's going to be another Blur situation here. That game was honestly incredible, I loved it to pieces. Same with Shox: Rally Reinvented but both of these games are now just memoirs on a few dead studios' tombstone. The fact I know how much you love out there experiences sums up the tough challenge Codemasters has to overcome here. The game isn't in the Top 100 UK Amazon sellers list...not exactly the greatest sign. Rustyhole and Wolfe like this. I've been thinking this as long as I've known about the game. It's bold and different, and I love that. And they probably thought it was a safer bet because of the inevitable Overwatch comparisons. But considering most people still haven't gotten the faintest idea how this game works, I'm not sure they read the room properly, and I'm worried it's going to doom another brave try in a genre that needs more bravery. Rustyhole, Miths and Wolfe like this. I've said quite a few times but I feel like it's going to be another Blur situation here. Ahhh Blur. Blur came out roughly the same time as Split/Second. I remember thinking Blur was MarioKart with power-ups and real cars and passed as that's not my thing (unless CTR). Then a year later came across S/S in the discount bin and picked it up. Genuinely one of my fav PS3 arcade racers. Most games with additional mechanics besides racing (Blur/LBP Karting) don't do as well as they could have if they were just racing. Sad because Evolution went with their heart and made Driveclub and stuck though the initial reception because they believed in it. Onrush seems to be a) different for different's sake and b) attempt to capitalize on games like PUBG/Fortnite which @Wolfe mentioned. Agree. The shelf life for Onrush will be fairly short as most people with only a passing interest will stick with the demo or wait for the inevitable PS+ release. And I think the average racer wants to race, and not enter whatever Onrush is for more than curiosity. I personally think Onrush has a hard slog ahead. I believe it's a sign that developers are giving too much weight to internet posts on 'what they want' vs those that honestly say 'what they'll pay for' for which the ultimate consequence is sequel after sequel. People's perception will be... this is a racing game because it has vehicles racing (kinda). Good luck Onrush... you're gonna need it. Amazingly, I dissed GT's photomode (it's a racing game, not a photography class) before GT4, but then it was the new feature I liked most so.... maybe Onrush is ahead of the curve. Since I'm not sure which will be the main OnRush discussion thread, I'll ask a question here. Are seasons working for anyone in custom mode? I've only gotten around to try the winter setting on three tracks so far, but there's most definitely not any signs of snow or apparent foliage changes. I wrote it a while back, what a month that was for arcade racing games! Rustyhole and ron24 like this. Adding to the distinction between what would interest me and why this game doesn't -- I have a copy of Shox and enjoyed it, but I was uninterested in Blur. Those powerups just put me off. Even in Mario Kart I only tolerate them to a certain degree. The dissonance with the real licensed cars didn't help. It seems to me like making a regular racing game with weapons/powerups is a risk in itself, as @Rustyhole mentioned, unless it's Mario Kart. And Split/Second -- well, I tried the demo and passed on it because it appeared to be mostly about avoiding grand setpiece hazards at the expense of compelling racetrack design (in terms of just driving itself). If it had a smaller scale with twistier tracks I might have been a fan. Sad that Sony wanted to cram ModNation into the LBP universe - presumably to promote Play Create Share, and piggyback on LBP's success. But personally I think it would've done better as ModNation 2. Just iron out the bugs, expand the features people liked like the track creator and instant success. Someone should make a new ModNation. (maybe Evo ). It seemed buggy to me on the PS3 and after the third loss of progress I gave up and switched to F1 Race Stars (!) which got replaced in short order because you couldn't set the buttons to your preference (I was still an X/O guy for gas/brake) so using the triggers frustrated me. it appeared to be mostly about avoiding grand setpiece hazards at the expense of compelling racetrack design (in terms of just driving itself). If it had a smaller scale with twistier tracks I might have been a fan. Wolfe, Brend and ron24 like this. I still don't understand the whole idea that it's a handicap to make a car game that's not about racing considering that, at least where I live, everyone seems to scoff at racing games. The internet is seriously the only place where I don't feel like an extra-terrestrial for loving motorsport. And with so many traditional racing titles on the market, how can anyone complain that one car game doesn't have racing in it? From my point of view when CM 'saved' Evo I thought it would be the start of a powerhouse. All they needed to do was help/speed up CM in making the next Rally & Grid games. With the two companies experience I feel that together they can achieve greatness but instead for their first release make a niche game that may not sell in great enough no.s to even justify the acquisition.. Seems a very odd/dangerous decision. Although this game probably isn't for me, I really hope it does well & doesn't signify their closure. Yes I haven't seen much snow in custom mode either. The sand dunes one has snow laid but not snowing (set to early dawn/morning/winter) I tried most the others in winter and no snow. Maybe I am also missing something. @MeanElf @RL_23 How do you get it raining/snowing in Custom matches please ? Supporting the studio will actually play a big part of me buying this game. I'll wait for it to drop in price a little as wasn't sold on the beta. It did more harm than good & just confused people during the limited time it was out. Apparently it wasn't the best track either. People moan that they're tired of playing safe games & endless sequels bemoaning the death of the arcade style racer. I was one of them so I'll not sit back & watch this bold effort fail. Hopefully they'll add a basic race mode later on. I reckon I'll be rewarded after a weeks play & can always sell it on eBay if it's not for me. There's not really any actual risk involved. Plus the soundtrack is absolutely banging. Ninja Tunes given the SSX style treatment. Sign me up! I'm enjoying the game, the game play is not for everyone but is scoring reasonably well overall on the reviews, it can be quite overwhelming when you first play or watch the game but you soon forget about winning and just try to take down the others (online quick match is very quick and stable so far). Longevity for me will be the photo mode and the quick match. @MrCrynox I think the market place needs some less serious 'fun' racers. This and Gravel are a really nice change for me (with so many other sims). I think it will sell well enough for them to keep the Evo team. Hopefully they are already working on TOCA or Rally style game. Although my preference would be another 'Road' racing game mixed with off road and a good mix of cars but not open world but have beautiful scenery and compete with FH3 I think that would sell on the PS4. ...@MeanElf @RL_23 How do you get it raining/snowing in Custom matches please ? No idea really, as I only had time for one run in custom match yesterday and probably won't have free time again until tomorrow. I'd say you are approaching it right but maybe the dynamic aspect needs tweaking to 'more frequent' - remember when weather was added to Driveclub how the dynamic setting would rain all of the time? It also might be set on lower frequency at least until they know the servers can cope - there have been a few server crashes reported last night - or maybe it's something we unlock? Sorry.